It’s onto Dallas, where the ironclad King of Kings battles his Kevlar-encased challenger, Roman Reigns. As The Road to WrestleMania rounds its final bend, Roman Reigns finds himself, once again, staring down the finish line and the prize at the end of the run. This time, however, it won’t be the unstoppable Beast Incarnate looking to deny The Big Dog, but current WWE World Heavyweight Champion Triple H, the unyielding figurehead of The Authority and the man who effectively snatched the title from Reigns in the closing moments of the 2016 Royal Rumble Match. That Reigns got back to this stage is remarkable enough: The tests he’s gone through since his Royal Rumble Match victory in 2015 would have caused a lesser Superstar to tuck tail and run. If nothing else, Reigns’ ability to plow past Lesnar and his best friend Dean Ambrose (again) at WWE Fastlane to earn the match with The Game should serve as proof to even his staunchest detractors that he’s made of stronger stuff than many gave him credit for this time last year. Whether desire is enough, this time, will be the question. It wasn’t last year, when Reigns, riding a mantra of “I Can, I Will,” put then-champion Lesnar on his heels in the main event of WrestleMania 31 before Seth Rollins swooped in and stole the show. There’s no Money in the Bank contract to potentially play spoiler in Dallas this time around, but this incarnation of Triple H never goes into battle without a Plan B, C and D to back up his strategy. Even though it’s billed as a one-on-one match, make no mistake: Reigns is fighting the machine itself, and The King of Kings need only gesture to his army of subordinates to help him hold down the man who ran roughshod over his “church” for years, both as a member of The Shield and the solo Superstar who brutalized The Game at WWE TLC 2015. Taking the title was less a feat of strength than a display of power, a symbolic gesture of The Game’s rule, and an affirmation that no one will take it from him easily. So it’s onto Dallas, where the ironclad king battles his Kevlar-encased usurper, a battle of one versus all in the disguise of a grudge match, with the ultimate prize on the line. For Triple H, his legacy and his position are at stake. For Roman Reigns, it’s his future. We know he’s capable. But whether he can or he will is barely even the question anymore. He must. Watch Reigns challenge The Game for the WWE World Heavyweight Championship on The Grandest Stage of Them All when WrestleMania airs live on the award-winning WWE Network on Sunday, April 3. Who’s heading to the main event of Wrestlemania 32 to face Triple H for the World Heavyweight Championship? The WrestleMania challenger of WWE World Heavyweight Champion Triple H will be determined at WWE Fastlane 2016 when Roman Reigns, Dean Ambrose and Brock Lesnar collide in a Triple Threat Match. The victor will go on to face The King of Kings at The Grandest Stage of Them All. The Authority announced WWE Fastlane’s star-studded and high-stakes main event on the Jan. 25 edition of Raw, the night after the Royal Rumble, and it brings into conflict not only three of WWE’s most popular Superstars, but also three of the most dominant. Prior to losing the WWE World Heavyweight Title to Triple H in the Royal Rumble Match, Roman Reigns appeared primed for a long championship reign. That all changed during WWE’s annual 30-Superstar fray, when Reigns suffered yet another injustice at The Authority’s hands. WWE Chairman Mr. McMahon orchestrated a gang attack by The League of Nations, and though Reigns rebounded from the four-on-one beatdown, he was ultimately eliminated by The Cerebral Assassin, who entered the Rumble Match as the surprise 30th entrant. Just how far is Reigns willing to go at WWE Fastlane to earn a title showdown against The Game, at WrestleMania no less? Brock Lesnar faced similar, if even more sinister, headwinds in the WWE World Heavyweight Title Royal Rumble Match. After laying waste to a ring full of Superstars, The Beast Incarnate was undone by The Wyatt Family as Luke Harper, Erick Rowan and Braun Strowman ousted him from the ring, even though they had already been eliminated. No doubt incensed over his Royal Rumble outcome, the always-dangerous Lesnar now has Feb. 21 circled on his calendar. Will The Conqueror return to the main event of WrestleMania by triumphing in WWE Fastlane’s Triple Threat Match? Rounding out the Triple Threat Match is the Superstar who is, perhaps, the most unpredictable competitor in WWE, Dean Ambrose. The Intercontinental Champion has been on an upswing following a strong showing in the Royal Rumble Match, where he finished as the runner-up, and a barbaric title defense against Kevin Owens in a Last Man Standing Match. Can Ambrose’s unhinged attack pay dividends and lead to his first WrestleMania main event? Will Reigns and Ambrose’s friendship survive their high-stakes battle? Will The Beast take both founding members of The Shield to Suplex City? And when the smoke clears, which Superstar will have punched his ticket for WrestleMania and secure a title bout against The King of Kings? Watch The Road to WrestleMania kick into high gear when WWE Fastlane airs live on the award-winning WWE Network Sunday, Feb. 21, at 8 ET/5 PT. Roman Reigns will finally get another opportunity at the WWE World Heavyweight Championship when he challenges Seth Rollins at Survivor Series on Sunday, Nov. 22. The Big Dog has had eight months to replay the final moments of WrestleMania 31 in his head. Reigns was seemingly on the verge of conquering Brock Lesnar and capturing the WWE World Heavyweight Championship, until Seth Rollins stole his WrestleMania moment — and the title — by cashing in his Money in the Bank contract and going on to pin Reigns. Ever since The Show of Shows came to a close, Reigns has been clawing to get back into the title picture. Last June, he had his hands on the Money in the Bank contract and a guaranteed WWE World Heavyweight Title Match, only for Bray Wyatt to foil his championship dreams. The Juggernaut was then sidetracked from the title picture while trying to vanquish The Eater of Worlds. He brought his rivalry with Wyatt to a brutal end inside Hell in a Cell, before turning his attention back to Rollins and WWE’s top prize. While Reigns was preoccupied with Wyatt, Rollins was busy trying to prove himself to The Authority and create his legacy as one of the greatest champions in WWE history. Though many have doubted Rollins’ mettle as champion, there’s no doubting his record, which includes wins over Dean Ambrose, Demon Kane, Sting and John Cena. Despite his Hell in a Cell victory, Reigns still had to earn his way back into becoming the No. 1 contender. On the Oct. 26 edition of Raw, The Big Dog defeated Kofi Kingston to advance to a Fatal 4-Way Match, where he bested Intercontinental Champion Kevin Owens, United States Champion Alberto Del Rio and Dolph Ziggler to get his long-awaited title opportunity. After winning the No. 1 contendership, Reigns engaged in a tense ringside staredown Rollins, his one-time brother in The Shield. Rollins held his title high, while Reigns responded with a confident smile. 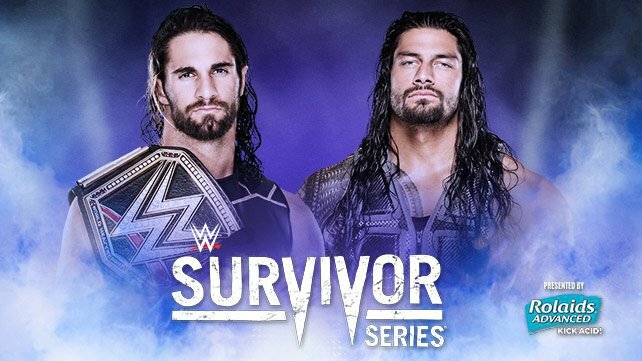 Who will walk out of Survivor Series with the WWE World Heavyweight Championship? Find out Sunday, Nov. 22, at 8 ET/5 PT, live on the award-winning WWE Network! Their brawls have smashed through ringside barricades and shattered announce tables, but on Sunday, Oct. 25, Roman Reigns and Bray Wyatt will fight to a finish inside Hell in a Cell, live on WWE Network. The match will be both Superstars’ first voyage into the career-changing structure. With the Cell door locked, no other Superstars will be able to enter the fray, raising the stakes for this deeply personal rivalry. In the past months, the Reigns-Wyatt beef has at times teetered on full-blown turf-war status, entangling Dean Ambrose, Luke Harper, Braun Strowman and even Chris Jericho. At WWE Hell in a Cell, however, Reigns and Wyatt will be left entirely to their own devices. Who will emerge from the inhospitable Hell in a Cell as the clear victor? Watch the brutal conflict when it airs live from Los Angeles’ STAPLES Center Sunday, Oct. 25, only on the award-winning WWE Network.